It worked! Thanks to my sister for her recipe & tips. Preheat oven to 500 degrees (not 450 like I had been doing) for 1/2 hour before baking. Bake on bottom rack of oven. I baked it for 8 minutes on the sheet then slid it directly onto the rack for the last minute. Was crispy on the bottom finally, not all floppy like before. Both the pepperoni/olive/garlic and the veggie were delicious — just ate the leftovers for lunch. I have to admit that I was obsessed with getting it right this time! Much to my family's relief, it turned out — or they would have had to listen to me complain about it all night. I almost lost my temper with the dough — guess it just takes practice. I lack patience! Sketched the toppings while the oven was heating up. 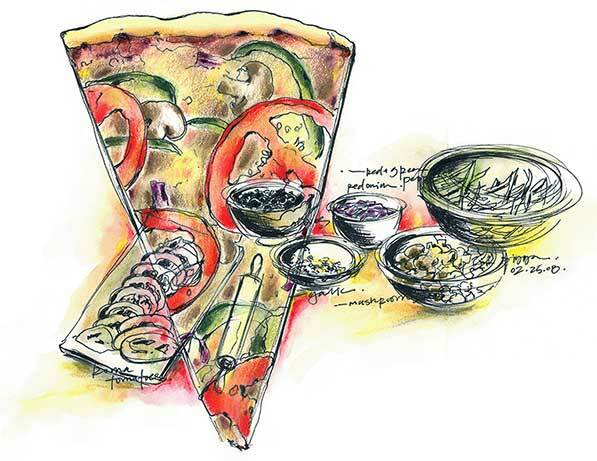 After dinner, drew the slice directly on top and colored with pencil and watercolor pencil. Nothing digital this time.